gorgeous outfit! i love the tangerine color!!! Beautiful and cool outfit, gorgeous! I'm so in love with that irregular sweater already, and, of course, the smarts of your styling! Love your look :) Amazing blouse! this is so beautiful, love the colours of your outfit! love your style and your Blog! cute look love the photos!! This outfit is so cute! I LOVE your coral button up shirt. That collar is adorable! So so cute! Also, you were featured on my blog as one of my favorite looks of the week! Beautiful city, I hope to visit it someday! Perfect outfit for taking the stroll downtown! What are the subtle shades shirt and sweater, stunning as always! In love with your mullet sweater!! How fun, love those girls, but haven't met them. What a stylish group you are! Happy Monday Bonnie! Such a lovely look! The hat is really cute! adorable look Bonnie. you are so pretty!! obsessed with the blouse and sweater combo! the lengths and textures work so well together! That jumper is the cutest ! I just adore your jumper! Oh you girls must have had a wonderful weekend together! Love the colors and layers! I love your Sweater! I love large and soft sweater! I'm also totally in love with your shirt, its collar is amazing! I think I adore all these colors! Your quickly becoming one of my favourite bloggers. I absolutely adore your look, its cute but stylish. And this jumper and shirt combo is gorgeous. you are always so, so cute! i love the studded collar on the blouse and the knit! adorable! Love this sweater, great outfit color combo! Love your sweater! It looks like you ladies had fun. Looove the sweater over it. Perfect for NY. Looks like you had a wonderful weekend!! (: I love the outfit. 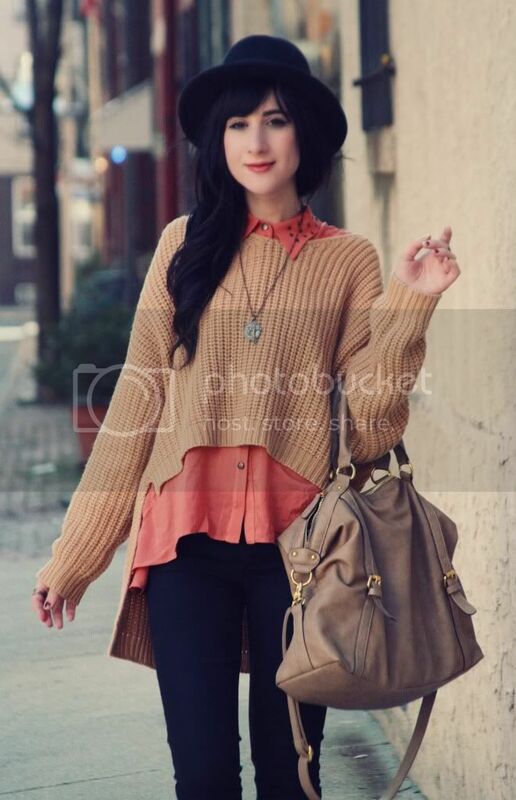 The blouse and sweater are adorable and I love the boots. Been trying to find a pair like those. Really like your casual outfit and the soft light of your pictures! Spending time with friends is the best way to spend week-ends! you look so lovely <3 i adore your outfit! I love your use of layering! You look great! You look gorgeous in these photos, the colours and textures here work really well together! I love this look! Your sweater is perfection. Lovely colors in that outfit! The sweater and that blouse look wonderful with the jacket! Gorgoeus again! Love the colors of this outfit! simply perfect! You look great! 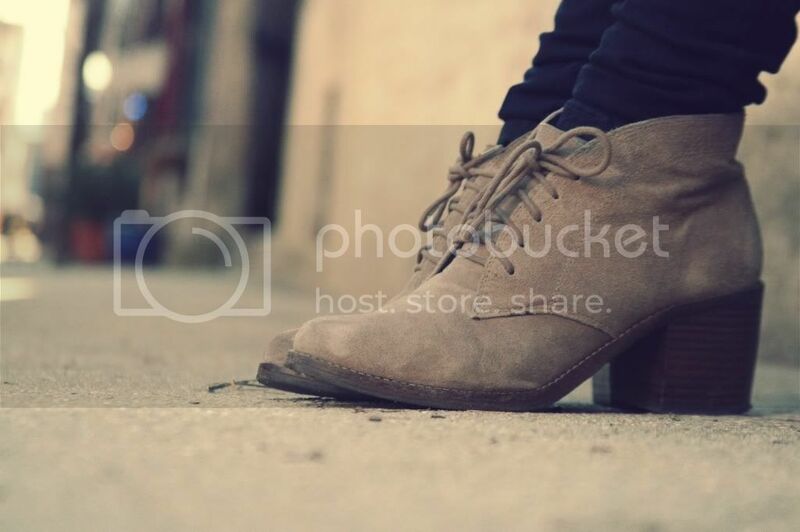 I love those boots! Gorgeous layering darling, love it! Love the peachy blouse, pretty! I love your top(s)! You have pretty much the best style ever!!!! lovely pictures!!! I love your cardigan!!!! I love the whole look down to the button down shirt covered with the tan sweater and the leather jacket and doughnut scarf. aw you all look like you were having fun! love all the stylish outfits too! love that asymmetrical sweater on you. it's perfect! 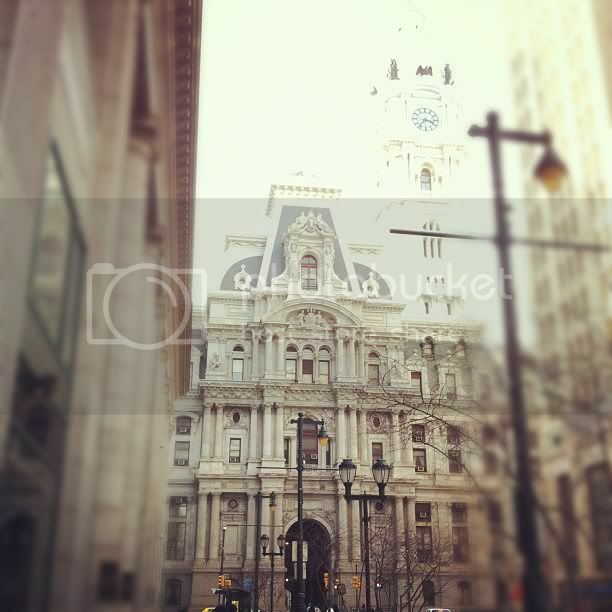 I've never been to Philly. Would love to visit. Love the way you layered your outfit. This asymmetrical sweater is great on you! 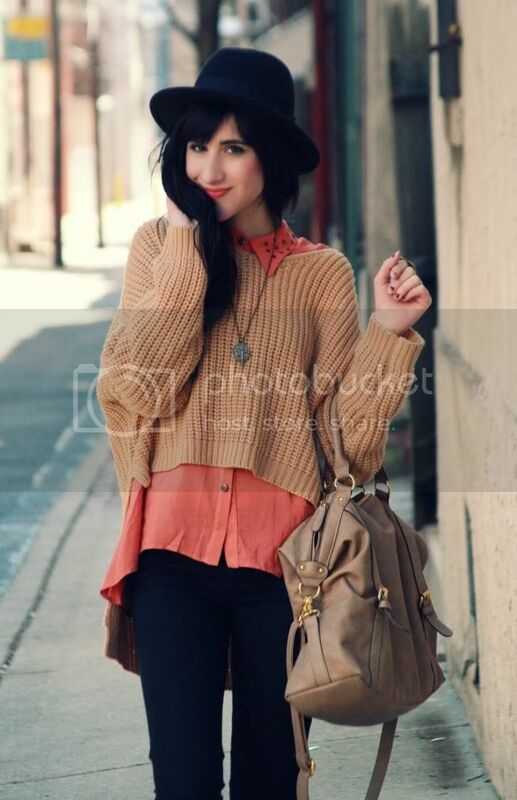 stunning as always <3 i love your sweater and bag!!! You three are so adorable! <3 And I love the peachy tones of your outfit, Bonnie! So so so beautiful! If you don't mind I saved your look to one of my Pinterest boards. 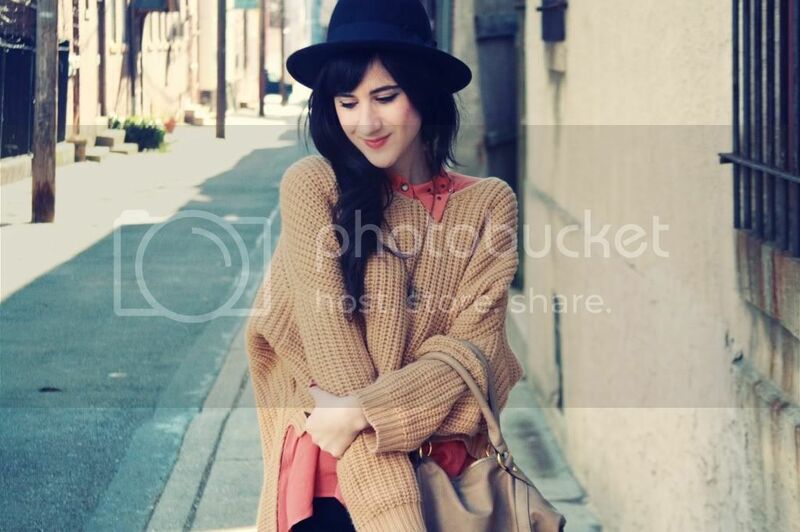 ♥ That blouse & sweater idea is so cute. 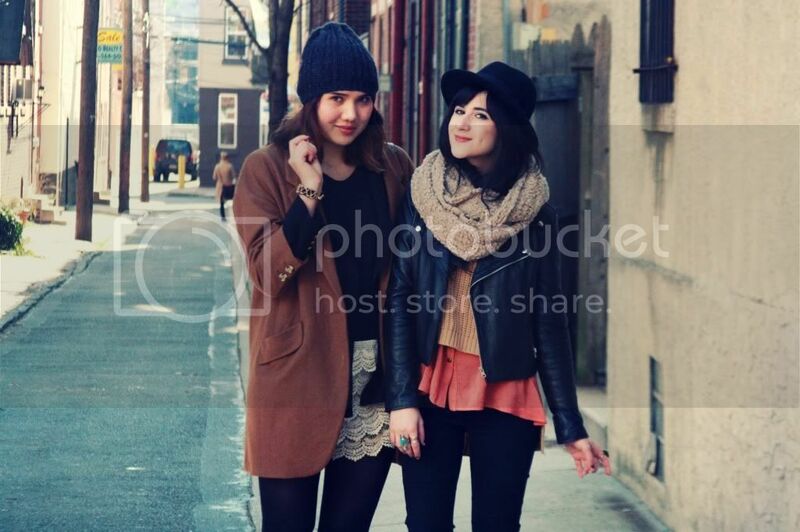 ohh you girls compliment each other's outfit so well, so cute seeing bloggers together! You look lovely. Love the layering! love love love your casual and laidback outfit! thanks for stopping by my blog!!! you are so cute. i absolutely am loving this whole look. the hat is really great on you and i love how the sweater is long in the back and short up front. so comfy! amazing bag!! The detail on the collar is so cute. sounds and looks like a wonderful weekend! You look adorable, Bonnie! And just to let you know I LOVE your photography, its's beautiful! Aw Bonnie you look so pretty :) as always you do! You all have gorgeous style. Love your outfit! I absolutely love this look, the shirt and the jumper are amazing ! awesome outfit, like always :)! oh my, your style is incredible! 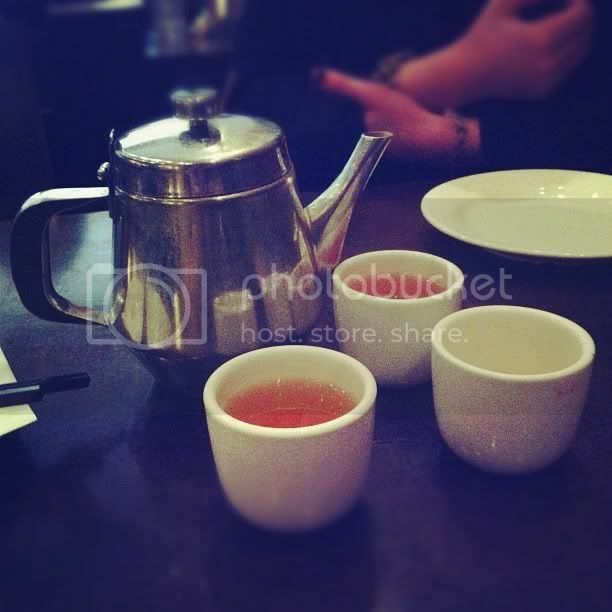 thanks so much for your recent visit and comment to my Marni post<3 cant wait to get me some Marniiii, yum. This is an amazing outfit! You look stunning! Aw, Bonnie you are just a doll! I love this outfit. You look so cute, like always of course! In certain scenarios, logos are finished inside a solitary shade although in others artka clothing; multitudes of colours are used to stand for the different varieties of clothing and accessories being marketed. As your symbol might be useful for advertising needs on banners, brochures, playing cards and also apparel, it ought to Chinese dress style be made keeping in your mind these features and it should really glimpse great wherever it truly is put.